RHONJ Reunion Trailer: Teresa Giudice Cries When Asked About Joe! RHONJ Reunion Trailer: Teresa Giudice Cries When Asked If She’s Separating from Husband Joe! The Real Housewives of New Jersey dramatic three-part reunion premieres on Wednesday, February 20. 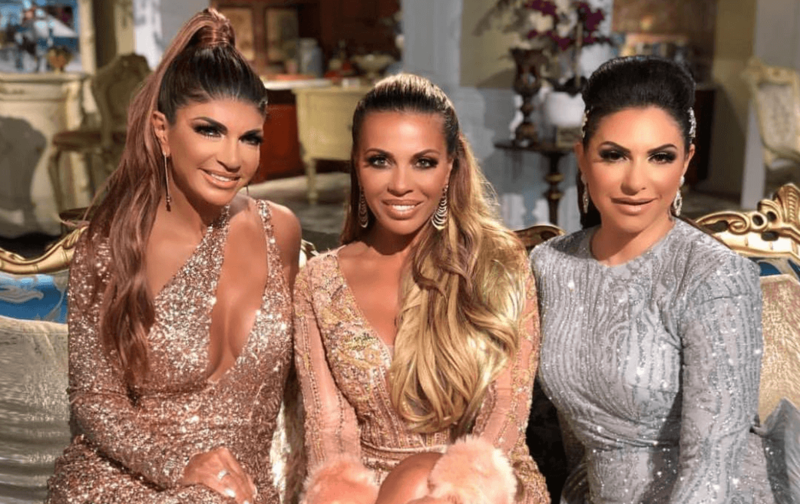 Teresa Giudice , Melissa Gorga, Margaret Josephs, Dolores Catania, Jennifer Aydin, and Jackie Goldschneider meet up to reflect on a season of new friendships, new frenemies and old family wounds. Friend of the housewives, Danielle Staub, also joins for a juicy reunion and ready to discuss her rollercoaster season. But season 9 reunion will be emotional for Teresa Giudice, as the 46-year-old mother of four breaks down in tears when asked about her future with husband Joe Giudice who will be deported to Italy after his prison sentence ends. “What you’re saying is that you will go your separate ways?” host Andy Cohen, 51, asks Teresa, who breaks down in tears. As previously reported, Teresa Giudice revealed at the reunion that she’s divorcing her husband, Joe Giudice, after he’s deported from the United States. “We’d go our separate ways,” the Real Housewives of New Jersey star reportedly told her castmates at the reunion taped earlier this month, reports People. Pretty hypocritical considering Teresa has said numerous times that she he would consider moving overseas with. But this time, Teresa tells host Andy Cohen that she had discussed the possibility with their four daughters — Gia, 18, Gabriella, 14, Milania, 13, and Audriana, 9 — and said that they would stay in the United States without him. Joe, 46, is currently serving a 41-month prison sentence for mail, wire and bankruptcy fraud that began in March 2016. In October 2018, judge, John Ellington ruled Joe be deported back to his native Italy, upon his release from federal prison in March 2019. Joe had one final chance to appeal the decision by November 9, but The Real Housewives of New Jersey star accepts unless “something extraordinary happens,” Joe will be kicked out of the country. EXCLUSIVE: NeNe Leakes Nobu DC Restaurant Diva Meltdown That Led to Her Social Media Blast Exposed! The 46-year-old fought hard to reverse his deportation order — claiming he considers himself to be American, having spent a large part of his life in the US, and being married to an American citizen and having four children birthed in America. As reported, the mom of four was a frequent no-show at her husband’s immigration hearings. She did not appear at her husband’s October 10, 2018 Immigration hearing — where her imprisoned husband begged the judge to stay in America with his family. Part one of the reunion kicks off on Wednesday, February 20, with Margaret and Jennifer engaged in a heated screaming match regarding their ongoing beef this season. Jackie is in the hot seat when Teresa accuses her of having ulterior intentions about joining the show and makes it clear that she will never forgive what Jackie said about her husband. The three-part Real Housewives of New Jersey season 9 reunion kicks off Feb. 20 at 9 p.m. ET on Bravo! Social Media Reacts To Margaret Josephs and Danielle Staub’s Explosive Fight! Melissa Gorga Claims Teresa Giudice Plotted to ‘Take Her Down’ at RHONJ Reunion!